Amongst the many good things in fine cabinet work bequeathed to us by Chippendale and his school, nest tables are not the least important. These tables are so made that three, four, or five small tables of precisely the same pattern may be packed away in the space occupied by the largest, of the series. Such a table is invaluable to the flat-dweller, where every inch of space is valuable. It can be purchased in plain mahogany for £2, and would measure about 20 inches by 14 inches. But at this price the legs would be turned, and not carved. An old nest would be costly, and it is hard to find a set which has been unaffected by accidents, but sometimes a series in really good condition is to be met with ; £10, however, would not be an extraordinary price to pay. Old satinwood tables are very rare and choice. The occasional table with flaps is another contrivance which keeps floor space clear. These tables can be bought in many varieties and of any size. It is extremely useful to be able to alter the size of our table at will, and the simple device of the moving leg, which can be pulled out to support the flap, ensures stability. The table with a shelf beneath, again, is very useful, since on the shelf can be kept a book of reference or a magazine. I recently examined a charming example of such a table. 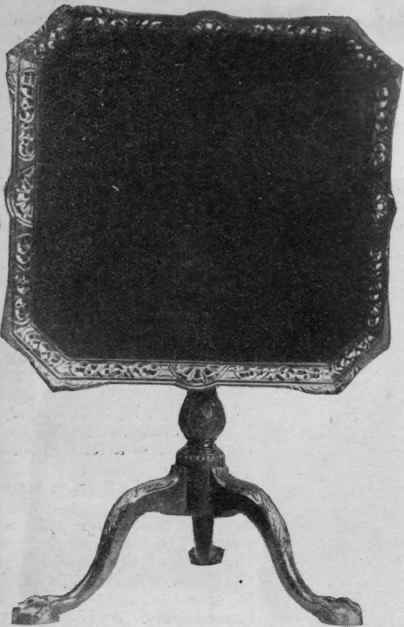 It had been made about 1780, and was of mahogany, inlaid and veneered. The old occasional tables were generally very richly ornamented. A Sheraton example is of walnut and oak inlaid in narrow bands, with lines of satinwood and maple. This has a square double top, the two halves folding over form a long table when required. This is another variation of the flap. 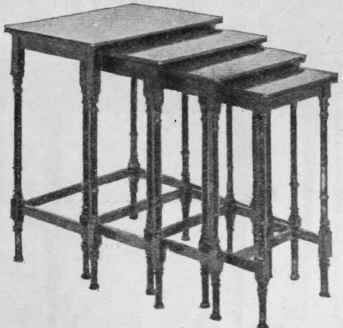 A modern example of the folding-top table such as this is a mahogany card-table. The open flap is supported by turning round the top so that the oblong support is beneath it. Such a table can be had for £1 18s., and is nicely lined with green cloth. Chippendale occasional table with gallery and carved legs. The gallery is a useful factor in preventing objects from slipping off the polished surface of the table is most useful for preventing small objects from rolling off the polished surface of the occasional table when it is being moved. Sometimes there is a small raised edge in the modern table, but, on the whole, the use of the gallery has been discontinued by the cabinetmakers of the present day. It was a useful custom to sell card-tables in pairs. This was frequently done, and the round-fronted English mahogany or satin-wood card-tables of the late eighteenth century are frequently found in pairs. They are extremely pretty, when not in use, standing against a wall. The pair seem to charm the eye in a way which is as unusual as it is delightful. Many people buy half a dozen of the cheap folding cloth-topped tables, keep them in the pantry or a cupboard, and use them only when they have a card party. Certainly these cheap and compact tables serve their purpose. But this is all they do ; their appearance makes it impossible for them to be kept permanently in the room. The specimen table is a great delight to those small collectors whose possessions have not yet assumed the number or proportion which necessitate their display in a cabinet. And it is pleasant to have a few treasures immediately under one's eye. 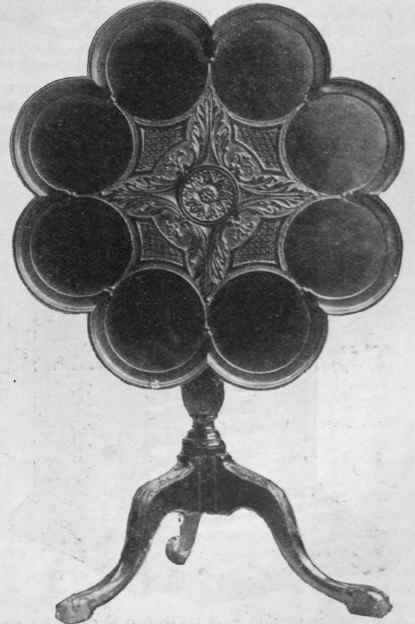 A few miniature pieces in old silver, a fan, a piece of lace, some peasant jewellery, a posy ring or two - such bibelots can be safely and pleasantly guarded in one of the little tables with glass-sided box and a good strong lock. Such an occasional table may well take the place of that abomination, the silver table, where a jumble of silver bits are exposed, and at the mercy of the housemaid, child, dog, and other destructive agencies. It is sometimes necessary to have a small meal brought into a room where food is not generally served. And the cup of soup, for example, or glass of milk and biscuit, which many women take in the middle of the morning surely are best placed on a small, steady table in drawing-room or morning-room. The tea-table is an important piece of furniture, and its form is generally the expression of the owner's individual taste. Some women like to have a table with top sufficiently large to hold the tray with tea equipment, and with branching shelves to hold bread-and-butter and cakes. This requirement is supplied by the cheap bamboo tables from Japan, or by more solid mahogany and fumed oak varieties made on the same plan. Other women like a low table, accessible from a lounge chair or sofa, and with an area sufficiently large to hold tea and food as well. Many pin their faith to a small, low table and the useful three or four tier stand for handing round with cakes for the choice of guests. There is no lack of variety in tea-tables, and it is probable that no two women have precisely the same taste in this particular, though all agree in their love for spotless napery and gleaming silver and china. The nightcap meal is another opportunity for the occasional table. Some families make this quite a cheerful little function, at which dainty home-made cakes and biscuits are provided, and the daughter of the house makes herself busy with lemon-squeezer, syphon, whisky stand, and so forth. Others, however, are content simply with a syphon and tantalus. 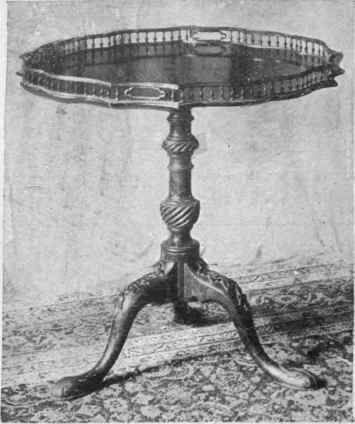 According to the elaboration of the nightcap meal, therefore, the size and shape of the occasional table must vary, but it is always best to bring out a special table rather than place a tray on one in use. It has always been a wonder to the writer that cabinetmakers, who usually leave no stone unturned with regard to their clients' comfort, should have neglected to put upon the market a chair which has its table of the occasional type to match it exactly in height, size, and shape. Why should not each easy-chair be sold with its own special table ? Certainly, each luxuriously padded seat requires a very particular table for use by the occupant who reclines therein. Some chairs are quite impossible for reading or writing ; they are frankly of the lounge order, and only require a small table placed adjacent to them whereon books or papers may be placed. Other chairs are of a more severe type, and seated in such we may contemplate letter-writing with equanimity. Such chairs may be low and comfortable, and yet suggest to us the possibility of correspondence, if only we had a table of corresponding height to support our paper supply and a writing-pad. Why should the modern cabinetmaker feel it his duty to supply only writing-tables which have shelves and pigeonholes, and must stand with their backs against the wall, and be of a height which demands a high chair ? We maintain that there is an opening for the enterprising manufacturer who realises that the letter-writer is, after all, human, and therefore sometimes tired, even though letters have to be written, invitations sent out and answered. Such a writer needs the support of an occasional table for writing letters without being obliged to maintain a bolt-upright position. We present the cabinetmakers with this suggestion : let us have an occasional table capable of being used as a writing-table, with a low, comfortable chair to correspond, and let chair and table match. The occasional table for the bedroom usually resolves itself into a small square or round topped table, sufficiently large to hold books, electric-light stand, as well as a cup of cocoa or a bread-and-milk bowl. Lest this be considered too large, let the early morning tea-tray be the test of size. Its height should be about three inches above the mattress. The table which stretches across the bed, with pole or wooden fitment for adjusting an invalid's meal, is a different affair, and scarcely comes under the heading of occasional tables.